Ground instant tapioca is an incredible thickening agent. Just pulverize some instant tapioca in a clean spice grinder until almost powder. That’s all there is to it, and the taste of the tapioca powder is much cleaner than that of flour or cornstarch. Just be careful not to add too much, or you'll be making cement! Now on to the banana splits! In addition to the toppings, you’ll need ice-cream, bananas, whipped cream, some chopped peanuts, and maraschino cherries if you like the works on your banana splits. Melt the butter in a saucepan over medium heat. Add the cocoa powder, sugar and salt and stir together. Next, add the evaporated milk. Stir until thickened enough to moderately coat the back of a spoon. Allow the chocolate sauce to cool to room temperature. Sauce will thicken upon standing. In a saucepan over medium heat stir together the strawberries with juice and the ground tapioca. Stir occasionally until thickened to your preference. In a saucepan over medium heat stir together pineapple with the juice, sugar, and ground tapioca. Stir occasionally until thickened to your preference. Notes: You can always add more ground tapioca if needed, but you can’t take it away. Chocolate sauce recipe via Scott the dish boy who prefers to remain anonymous. Other recipes by Laura Flowers. I tried to grind tapioca in my blender a while back, no go. A coffee/spice grinder, yes I can see that would work. It is a lovely thickening agent so is arrowroot. I really need to try arrowroot. I think I'll pick some up. Thanks! MyKitchenInHalfCups, I'm not sure if you'll come back here but I wanted to tell you I can't comment on your posts. The box doesn't work for me. I've been trying for awhile now. I've never used tapioca powder but I use arrowroot, potato starch and cornflour as thickeners depending on what I working with. I love it for sweet things Mary. I need about 1/4th to 1/3rd as much as any other thickener. Love the simplicity if these Laura - I will be giving them a try for sure! 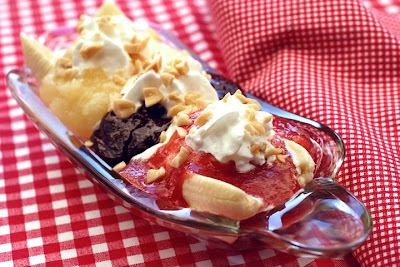 I love banana splits, retro-classic! I can't remember the last time I had one, maybe I'll break the fast with this! Great toppings. Do you have a recipe for rich and creamy caramel sauce? I rather make it than buy the jar. You are really on a fattening roll, here. Is it the warmer weather? But I would love a banana split! Mmmm. Oh yum! Exactly what I crave on a hot day like today, this one looks like a classic! YUMMY!!! That chocolate sauce is definitely one I'll have to try. Looks great! once i get back home i'm going to make this for my wife.